Note: This story was updated on January 27, 2017. 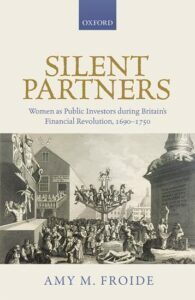 Amy Froide, acting chair and associate professor of history, recently appeared on WYPR’s Humanities Connection to talk about her new book Silent Partners: Women as Public Investors during Britain’s Financial Revolution, 1690-1750 (Oxford University Press, 2016). The book examines the role of women investors in England’s financial revolution and explains how many women played a critical role in Britain’s rise to economic, military, and colonial dominance in the 18th century. In her audio essay for Humanities Connection, Froide explained that women of all ranks were early-adopters of the stock market in the 17th and 18th centuries by investing in stocks and shares for their families and British government-run state lotteries. “Female investors exercised various types of financial agency. They actively managed portfolios of stocks they inherited, instead of passively collecting dividends; they served as financial agents or brokers, and they engaged in legal and political business with companies,” Froide explained. Froide referenced examples such as Sarah Churchill, the Duchess of Marlborough, whose investments had an impact on Britain’s interest rates, and the noblewoman Eleanor Curzon, who sued the South Sea Company and won. “Collectively, female investors enabled Britain’s rise to a military, economic, and colonial power in the 1700s, and women’s capital was a critical component of British imperialism. These ‘financial patriots’ are now brought to life and are silent partners no more,” she added. (Oxford University Press, 2005) and Singlewomen in the European Past, 1250-1800 (University of Pennsylvania Press, 1999), co-edited with Judith M.
Bennett. She has served as the book review editor for the Journal of British Studies, President of the Mid-Atlantic Conference on British Studies, and the founding Director of UMBC’s Entrepreneurship & Innovation Minor. Read more about her work on the history department website. Froide’s book Silent Partners was published on December 13. Listen to the full Humanities Connection segment on the Maryland Humanities website. Read the full review “Silent Partners: Women as Public Investors during Britain’s Financial Revoloution, 1690-1750” on the Times Higher Education website. Header image: Amy Froide in her office.